Are you looking for a wallet which looks extraordinary? If you do, then this one is just right for your needs. The wallet we have here is modern, sophisticated and it looks perfect in any way imaginable. 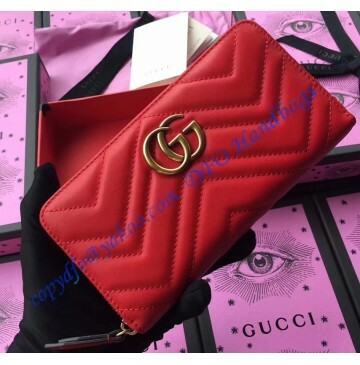 Gucci GG Marmont is one of rare wallets with chevron design made of red leather which truly looks great. Of course, the design is the main characteristic here, but not the only one. 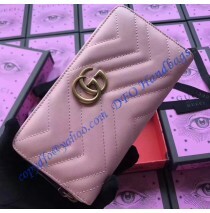 This Gucci GG Marmont zip around wallet also comes with a high level of practicality. Inside there is space for 12 credit cards, three compartments and one zipper compartment for coins. In a nutshell, the entire wallet is optimized for practicality. In addition, the zipper closure will make sure all of your credit cards and coins will stay safe and sound at all times. So, we have a wallet which looks incredible and which is more than just practical. All women who are looking for either of these two facts should consider this one. 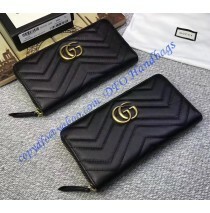 It is an extraordinary accessory designed and made by Gucci, so the quality and the originality must not be taken into question. The dimensions are 7.5 x 3.9 inches, so you can be sure that the wallet will fit perfectly any bag or a pocket you want to place in it. It is a great fact how designers were able to incorporate 12 slots for credit cards in this small wallet. On the other hand, bills will fit perfectly as well. Once again we must mention this red design. It is remarkable in any way imaginable and it is great that you can now purchase a wallet which looks like this. 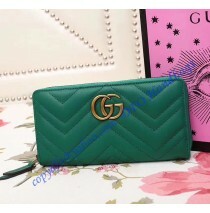 In essence, you will be a proud owner of this Gucci zip around wallet which will make you noticed regardless of where you are at that time.